While not historic, the Harbour Town Lighthouse is nevertheless an iconic image of Hilton Head. This 90-foot tower was built in 1970 – the first privately-financed lighthouse to be constructed since the early 1800s. Many visitors enjoy the beautiful view the lighthouse offers of Hilton Head, Daufuskie Island, and the Calibogue Sound. 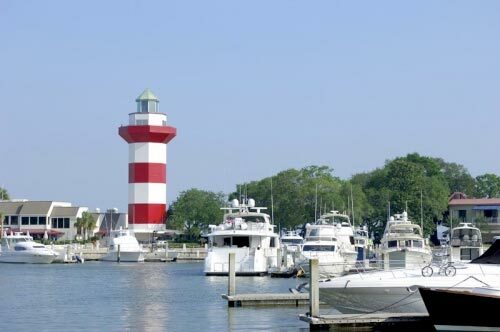 The red and white lighthouse is the backdrop of the final hole of the popular Harbour Town Golf Course, and it has become a widely-recognized landmark. There is a gift store at the top of the lighthouse and historical information about the area within. Even though the tower was built to be more of a symbol for the area than to assist with navigation, its light can be seen 15 miles away. See the view for yourself with the Harbour Town Lighthouse webcam! Calling All Photographers & Artists! Over 80,000 different people visit the South Carolina Picture Project every month. Submitting a picture is a great way to bring attention to you or your town. Please send us your pictures and help us celebrate South Carolina's history, culture, and beauty. 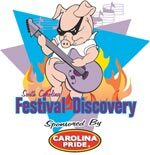 Discover what rural America is all about during the award-winning South Carolina Festival of Discovery, in beautiful Uptown Greenwood. Enjoy the weekend rubbin' elbows with the BEST barbeque cooks from across the country, while listening to the rich sounds of the blues! Held the second weekend in July, the festival features fun for the entire family including a Barbeque & Hash Cook-off, a "Blues Cruise," and much more. From badminton to bocce to bowling to boats to bikes to bingo, Beaufort's Water Festival has it all! Enjoy 10 days and nights of pure summer fun with concerts, dances and balls, golf tournaments, sailing regattas, an arts and crafts market, a parade, air and water shows, and much, much more. 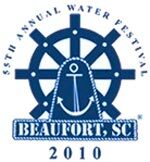 With all this, the 55th Annual Beaufort Water Festival promises to be the best one yet! Want to see the full calendar? Just click here to check out SCIWAY's complete calendar of July SC events! Also, remember that all of our event calendars, for every month of the year, are available on SCIWAY's website 24/7/365 – just go to https://www.sciway.net/calendar.html. © SCIWAY.net, LLC. SCIWAY News is written by the team at SCIWAY – with a lot of help from people throughout South Carolina. ISSN: 1527-3903. You are welcome to distribute complete, unaltered copies of this issue to anyone in any format ... or to include parts of it in printed publications. But please indicate the source (SCIWAY News, May 2010) and include our web address (www.SCIWAY.net). Thanks!